Rochester, NY is located at the southern end of the beautiful Lake Ontario, where the Finger Lakes connect to the Great Lakes. It is a city with great dining, historical sites and museums, and much more! Rochester, NY is known for being a festive place throughout the year. Filled with fresh fruit and gourmet goodies, this classic basket combines the sweet satisfaction for fruit with savory flavors. Recipients will enjoy fresh seasonal fruits such as apples, oranges, bananas, and grapes. 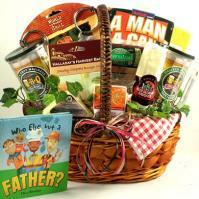 The basket is then packed with gourmet indulgences such as sausage, crackers, cheeses, and more. As New York's third largest city, Rochester's population was estimated at 215,093 as of 2003. The city is located in Monroe County as the county seat and was named for Colonel Nathaniel Rochester who was an early settler in the area. Nearby cities include Pittsford, Greece, Irondequoit, Brighton, and Gates-North Gates. Rochester was once called Rochesterville and nicknamed "Flour City." Later, this nickname was changed to "Flower City!" Rochester, New York was once a boomtown with a strong industrial presence during the 19th Century. It was ranked as the flour-milling epicenter of the United States. Large quantities of flour and grain were being shipped to New York thanks to the Erie Canal. In 1848, the famous newspaper called "The North Star" by Frederick Douglass had its beginnings in Rochester, NY. Also, many successful corporations had their start in Rochester, including Eastman Kodak, Bausch & Lomb, and Xerox. Rochester, New York has been home to some well-known people such as the suffragist Susan B. Anthony, actor John Lithgow, opera legend Renee Fleming, actor Robert Forster, actor Taye Diggs, and musician Chuck Mangione. The 1981 movie titled "Fear No Evil" was filmed in Rochester, NY as well. Rochester, NY is also home to several sports teams: Red Wings (MLB), Rattlers (Major League LaCrosse), Raging Rhinos (USL soccer), and Americans or Amerks (AHL). Rochester, New York is known for its great festivals and events throughout the year. Locally, there are the Lilac Festival, Clothesline Festival, Oktoberfest, Corn Hill Festival and the Festa Italiana. Throughout the summer, Rochester, NY has a "River of Light Show" that can be viewed from the Pont De Rennes Bridge on Platt Street. The "Party in the Park" happens between June and August, offering a free laser show and music concert every week. Visiting Downtown Rochester, New York offers much for the tourist and local resident alike. There's shopping, night clubs, great music, theaters, sports, and more than 100 restaurants for great dining. Other popular cities we deliver to in New York include Bronx, NY, Brooklyn, NY, Buffalo, NY, Long Island, NY, New York, NY, Manhattan, NY, and Syracuse, NY. For fun with the family, there's the Seabreeze Amusement Park, located just off Lake Ontario. It offers great scenery and historical sites as well. There's an 80-year-old roller coaster as well as a carousel dating back to 1915! At the Rochester Museum and Science Center, adults and kids alike will enjoy exploring all the interesting exhibits and collections. They can learn how things work and learn about history as well. There's also a giant 65-foot planetarium for star shows, laser shows and films. Other museums in the area include the Strong Museum, the George Eastman House, and the Memorial Art Gallery. Those who enjoy getting out in the fresh air can visit the Genesee Riverway Trail, where biking, jogging, walking and roller blading are encouraged on a 13-mile scenic trail. There's also Highland Park, Genesee River's High Falls, and other great places to visit while in Rochester, NY. Rochester, NY is a small town with plenty to offer everyone. Those planning a visit can go to the city's Web site for more information.